Everyone who spends time observing wildlife at our latitudes probably looks forward to the times which are now just about upon us. Now is the time when all the migrants start returning from their winter quarters, and the sedentary birds are already busy courting, building nests, laying eggs etc. 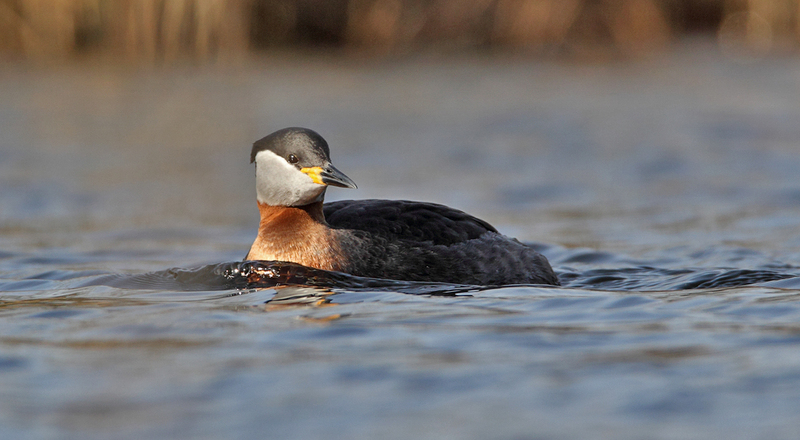 One of the great sounds of nature at this time is the almost pig-like squealing of the red-necked grebes. They are very territorial, and go to great lengths to keep their territory to themselves, chasing off intruders with a vengeance. I had the privilege to spend a few hours with a pair at a local forest pond, and even tried to shoot their portraits while I was there. I was using the borrowed 1Dmk IV along with the EF 600mm L lens, and I even had the extender on, something I should probably not have done. This gives me a whopping 1092mm f5.6 lens, and with relatively large birds like the grebes that just shouldn’t really be necessary. Anyway, both I and the AF struggled a bit, and the shots aren’t as crisp as they could have been, but that is besides the point considering the excellent time I had with these pretty, and vocal, birds. The gallery is just a small sample of what I brought home, remember to click them up in size!